The Pink Panther: When a star soccer coach is murdered and his priceless Pink Panther diamond stolen, France is in an uproar. Fortunately, Inspector Jacques Clouseau (Steve Martin, Bowfinger, Cheaper by the Dozen) is on the case. He doesn’t have a clue, but for Clouseau, that’s just a minor detail. With his partner, Gilbert Ponton (Jean Reno, The Da Vinci Code, The Professional), he careens from one misadventure to the next, leaving may..
Steve Martin returns to the scene of the fun as the brilliant, bumbling Inspector Jaques Clouseau in this side-splitting slapstick comedy for the whole family! When legendary treasures from around the world are stolen, including the priceless Pink Panther diamond, Clouseau is assigned to a dream team of international detectives who are under pressure to bring the master thief to justice before he strikes again. Co-starring Jean Reno, Al.. Along with co-stars David Niven, Robert Wagner and Capucine, comedy genius Peter Sellers first introduced the world to the hilarious, bumbling French Inspector Jacques Clouseau in this 'delightful caper' (Leonard Maltin). When a suave jewel thief (Niven) sets out to rob a princess of both her heart and her priceless diamond, The Pink Panther, Clouseau falls all over himself - literally - to try to stop the crime.Special Features Blake.. In this engaging installment of the Clouseau comedy adventures, the Inspector (Roger Moore) is missing, so the French president orders Clouseaus archrival - the dangerously deranged Dreyfus (Herbert Lom) - to find him. Naturally, Dreyfus has no such intentions, so he ingeniously hires the worlds worst detective, New York Police Departments not-so-finest Clifton Sleigh (Ted Wass), to ensure that Clouseau is never located. But it is begin..
Chief Inspector Dreyfus (Herbert Lom) happily believes that Clouseau (Peter Sellers) has been assassinated by Philippe Douvier (Robert Webber), a powerful drug lord. But in reality, Clouseau is very much alive and busy mangling the case against Douvier! Using absurdly mismatched costumes and accents, Clouseau travels to Hong Kong to intercept a major heroin deal, bringing Cato (Burt Kwouk) and the drug lord's jilted lover (Dyan Cannon) ..
Insanity is relative in this infectious laugh riot starring "gifted comedian" (Variety) Roberto Benigni, along with Panther alums Herbert Lom, Burt Kwouk and Claudia Cardinale. Fueled by Benigni's "wacky charm" (Blockbuster Entertainment Guide), Son of the Pink Panther proves that a family resemblance can sometimes be painfully obvious! When an Arabian princess is kidnapped, Chief Inspector Dreyfus (Lom) sets out to save her, with no Cl.. In this ”gaspingly hilarious” (Leonard Maltin) romp, the hapless Inspector Clouseau (Peter Sellers) is assigned to a high-profile murder case, where he finds himself falling, literally, for the prime suspect – a beautiful maid named Maria (Elke Sommer), whose talent for being in the wrong place at the wrong time almost rivals Clouseau’s. But as the body count grows higher, and Maria’s criminal record grows longer, Clouseau will have to ..
Steve Martin returns to the scene of the fun as the brilliant, bumbling Inspector Jacques Clouseau in this side-splitting slapstick comedy for the whole family! When legendary treasures from around the world are stolen, including the priceless Pink Panther diamond, Clouseau is assigned to a dream team of international detectives who are under pressure to bring the master thief to justice before he strikes again. Co-starring Jean Reno, A..
Own The Pink Panther Boxset (5 Films) DVD from Deff, DVD, Blu-Ray & 4K Video Specialists - Free UK Delivery.. The Pink Panther is - paws down - the world's grooviest cartoon star. In 1964, the pink-inked feline slinked onto the opening credits of a live-action film comedy and not only stole the show...but also the hearts of the critics, audiences and sophisticated cinephiles alike! And though the cartoons continue to this day, the earlier entries are considered classics. Collected here for the first time are all of the original cartoon favourit.. Along with co-stars David Niven, Robert Wagner and Capucine, three-time Academy Award Nominee Peter Sellers first introduced the world to the hilarious, bumbling French inspector Jacques Clouseau in this “delightful caper” (Leonard Maltin). When a suave jewel thief (Niven) sets out to rob a princess (Claudia Cardinale) of both her heart and her priceless diamond, the Pink Panther, Clouseau falls all over himself - literally - to try to .. The comic genius of Blake Edwards and Peter Sellers meet again in The Return of the Pink Panther. The "Pink Panther Diamond" is stolen with only one clue left behind - a white glove, the trademark of the world-renowned jewel thief The Phantom (Christopher Plummer). Believed to be retired, he immediately becomes the chief suspect on Inspector Clouseau's list. Wanting to clear his name, The Phantom sets out to find the real thief and send.. 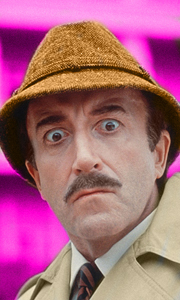 Inspector Clouseau, the lovable buffoon with a knack for mispronunciation, is MIA! Peter Sellers "induces gales of tonic laughter" (The Hollywood Reporter) in this wild adventure featuring the return of the ensemble cast, including David Niven, Herbert Lom, Burt Kwouk and Capucine, as well as Joanna Lumley, Richard Mulligan and Harvey Korman. First the Pink Panther diamond is missing, then Clouseau's plane is missing! And in order to me..
Own The Return Of The Pink Panther DVD from Deff, DVD, Blu-Ray & 4K Video Specialists - Free UK Delivery..